I arrived in India last night, a bit after 9 pm local time. My ultimate destination is Pune, but since there are few direct flights, I came into Mumbai where I’ll stay overnight; next morning I’ll drive to Pune. The Mumbai airport was in reasonable shape, overall equal in amenities to any US airport. A driver was arranged in advance, and leaving customs I see a long line of sign-bearing men – some signs indicate travel groups, others names of businesses, others just names. I quickly spot a sign saying “IBM Fernando Salazar” and off we go to the hotel. It is dark and I can’t see that much, but I can see that the airport is embedded right in the city of Mumbai. We are instantly on an urban street full of activity. One sign proclaims “Happy Joy Restaurant”. We pass several cell phone stores. People are idling about small shops and stands, many just lean-tos of corrugated steel. There is a lot of construction, and we pass a file of construction workers, all wearing identical reflective vests and carrying hard hats, maybe 30 men in all; I can’t tell if they are marching to or from. 3 wheel cabs are abundant. The traffic is very heavy and horn beeping is constant – but not the irritated “move yourself out of my way” beeping of a city like New York. The beeps here are short and targeted, a kind of communication, like “Here I am” or “I am moving forward”. Anyway, now it’s morning and waiting outside the hotel one of the first things I see is a chicken truck – of four levels, constructed of mesh, full of chickens. As the truck jostles over 1 speed bump, then another, all the chickens flap their wings up in unison. At 8 am my driver arrives – the same one from last night — and we set off for Pune. The traffic doesn’t seem that heavy to me, but I don’t know what’s customary for Mumbai on a Sunday morning. Here and there we can get up to a good speed, say 60 kph. Only a few minutes after leaving the hotel we pass a family of four on a two-wheeler: Father, wearing a motorcycle helmet, driving; Mother wearing a sari sits an imperturbable side-saddle behind him; in front of Father is younger Daughter, maybe three years old; and in front of her is older Daughter, I guess seven years old, black haired and wearing racy black sunglasses, she smiles as she grips the inside of the handlebars, wind blowing back her hair like she was an action heroine. A bit further on we passed this car. 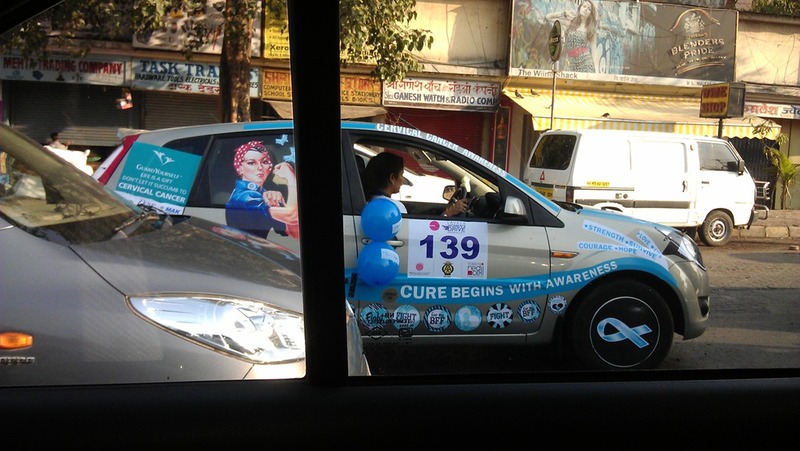 This was a part of the Lavasa Women’s Drive – an event to raise awareness of cervical cancer. We passed cars that were part of this all the way to Pune. The air in Mumbai was somewhat hazy with smog, but an hour out from the city the air became clearer. 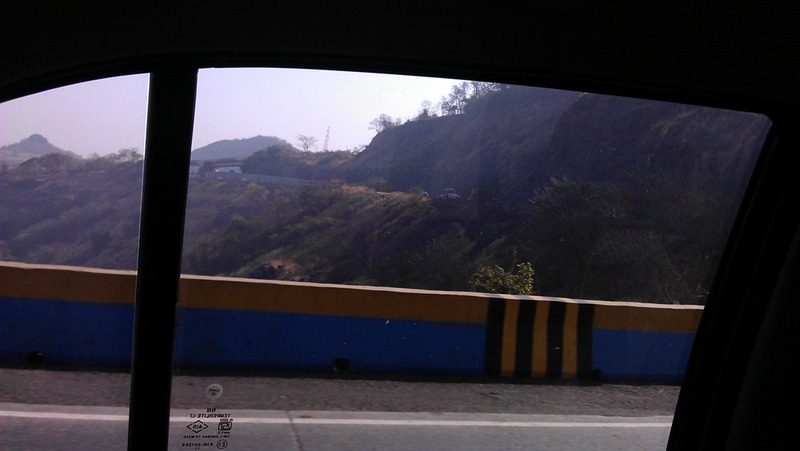 Most of the way was uphill – Pune is over 1,800 feet above sea level. Here’s one of the switchbacks we passed; there were several more like this as we climbed higher and higher. We also went through hills as well as over — the road went through 3 mountain tunnels. The walls of these were just stone – no masonry or reinforcement, it’s like the tunnels were bored through solid granite. Reaching Pune the traffic became heavy. I began to see that in India lane markers on roadways are really just suggestions – traffic flows to fill all available space, with trucks marking out big spaces, small cars filling the spaces between trucks, and two-wheelers filling the spaces between everything. Once again all the vehicles use short, sharp beeps to indicate position and intent – its seems you need sonar to be able to drive in India. 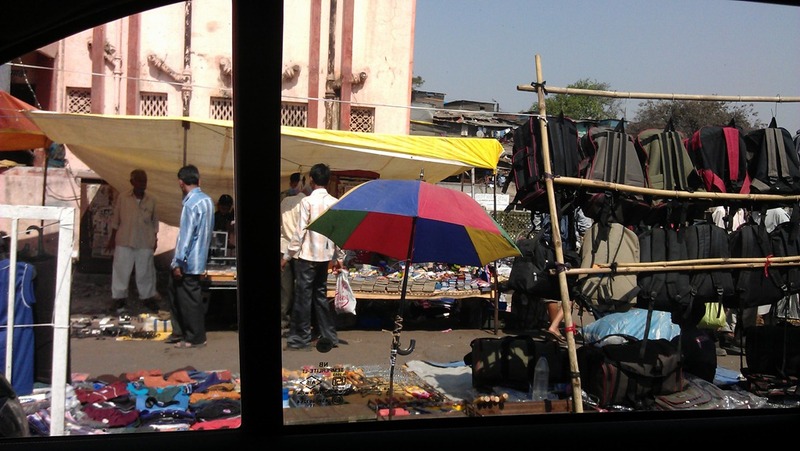 Almost to the hotel in Pune, we passed an open air market, selling luggage,clothes, shoes, CDs, bicycle wheels, brass ornaments, jewelry – or at least those were the things I could see from the car. I’ll be meeting my friend Bhavuk in a few hours, I’ll have to ask him about this. That’s all I have for now. Tomorrow starts the work week, but I expect I’ll do one more post before I head back on Thursday. Despite wikiPedia’s paltering on the subject, there is only one subcontinent as far as I’m concerned: India. I depart tomorrow for a 1 week trip, flying to Mumbai, and from there by car to Pune, and later back to Mumbai. This is a work trip, culminating in a visit to Lotusphere Mumbai – but I do expect I’ll spend some off-work time with my India-lab colleagues. Blogging and pictures when I return. Cranch might not have been so enraptured had he known the aurora borealis is caused by solar flares. The latest IEEE Spectrum has an article on the damaging effects of solar flares, and friends, seeking starry choirs is the least mischief these electric phosphorescences intend. But as overwrought as he was, Cranch did get the electric part right. Solar flares occur when the Sun ejects massive amounts of material – on the order of a billion tons – in the form of charged particles, outwards with great force. These particles – electrons and protons – do 2 things: First, the particles beat back the shielding magnetic field of the Earth and create charged plasma in the upper atmosphere, called an electrojet. Current in the electrojet can exceed millions of amperes; these high-up currents can induce smaller, damaging currents at ground level. Second, the impact on the magnetosphere causes waves in the Earth’s magnetic field. These waves are powerful enough to create GICs – geomagnetically induced currents – just as spinning a magnet inside a copper coil induces a current. GICs can be 100s of amps per incident. Most of the time, these two effects are small, limited only to Cranch’s lonely apparition-type fires. But sometimes, these flares are really big. In 1989 all of Quebec was blacked-out in 30 seconds; its grid experienced 15 simultaneous failures and that instantly cascaded into province-wide failure. Bad as that storm was, there are recorded events of storms even bigger, including an 1921 storm that blanketed all of North America and most of the Pacific, and an 1859 storm that was much larger still. 2012-2013 will see the solar max, a period of increased sunspot activity, and also of increased solar flares. The entire world is considerably more electrified today than even in 1989, and very much more than in 1921. That means we are all the more vulnerable. Nuclear power plants are exceptionally vulnerable because of the very large number of transformers and lines that service a nuclear facility. An 1989 or greater size storm that hits the US East Coast could have devastating effects. The Spectrum sounds a hopeful note, however: Transformers can be protected from GICs with new, relatively inexpensive technology. Will we do it, though? I have to say, unlikely – it is more in our social nature today to risk billions or even trillions in damage, rather than spend millions in prevention. Here’s hoping that the auroras of this year and the next bring us no more than fantastic dreams. There’s more than a little rhetoric in these questions. Most musical questions are erotema, while Pete Seeger clearly knew all about hypophora.